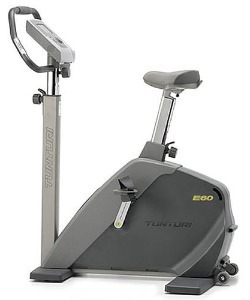 The Tunturi E60 upright bike has the same frame and flywheel as the E80, and if you don’t need more than 40 programs, you can enjoy saving over $600! The basic console on the Tunturi E60 upright bike has a full color 4'' graphic display that shows basic feedback of time, distance, and speed. The wide array of 40 programs includes 10 preset, 20 user defined workout, 5 heart rate control workouts, and 5 T-Ride™ programs for realistic simulation of road riding. UPDATE: The E60 upright is no longer available. Check out the latest models on the Tunturi website. The Tunturi E60 upright bike has a smooth and silent electromagnet brake and a large flywheel, and an easy mount low step-through frame. It features a heart rate belt, an ergometer, transport wheels, and contact heart rate monitoring. The adjustable seat and handlebar moves fore and aft, as well as height. The seat and monitor also have tilt adjustments. There are three console options with the Tunturi E60 bike: the basic color console, the E60 Media, and the E60 Pro. The advanced screens have more programs, a larger 7'' video monitor, plus a built-in DVB-T receiver to watch Digital TV while training. According to exercise bike reviews, the ergometer and heart rate control programs are Tunturi’s specialty. Programs such as the exciting T-Ride™ programs show outdoor landscapes on the full color screen as you pedal. Each program’s resistance changes as you use gears to climb hills and ride through flats. Best of all, the display is interactive; if you slow down and stop, or pedal as fast as you can, the outdoor view on the video program responds accordingly. The graphics and outdoor simulations, plus the optimal ergonomics and expansive programs make Tunturi bikes a great choice for training or just getting into shape. The $1450 price of the Tunturi E60 is a better value when compared to the E80 upright that sells for over $2000. You can order one from Big Fitness, the giant fitness equipment retailer located in Rhode Island, but there are no other distributors in the US or Canada. While service and replacement parts won’t be a problem for many years, if it does happen, you have few options for help other than contacting the company in Finland. While the Tunturi E60 upright bike is hard to pass up, if this is all too exotic, you can save time and money by going with a better-known brand that is readily available and serviced in North America.